A May 1908 Act of the Pennsylvania State Assembly initiated the organization of the 50th reunion of Confederate and Union soldiers on the battlefield at Gettysburg by creating the Battle of Gettysburg Commission. That commission formally invited all other states and the U.S. Congress to participate in the organization of a fitting observance of the semicentennial of the greatest battle fought in the Western Hemisphere. 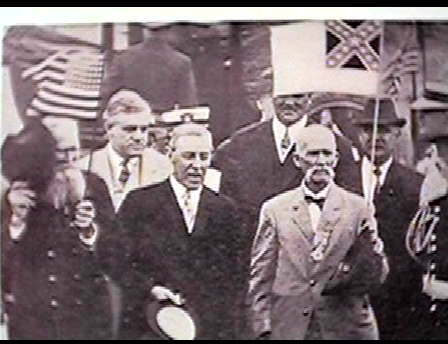 In June 1910, the U.S. Congress created a joint special commission of cooperation for the event, and during the next three years several conferences were held with representatives of the various states as well as the Grand Army of the Republic, the Union veterans association, and the corresponding Rebel organization, the United Confederate Veterans. The reunion was funded by a $185,000 appropriation from Pennsylvania and $150,000 from the federal government. As the date for the reunion grew near, most railroad companies offered reduced fares for the 40,000 veterans expected to travel to the event, and the commission started preparing the reception for the honored guests. A great camp was set up around the battlefield; the War Department provided camp and garrison equipment with all quartermaster, commissary, and hospital supplies necessary for the care of the attendees. 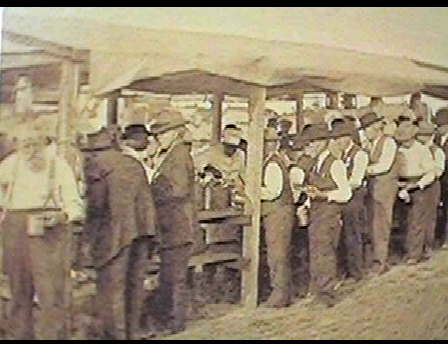 The camp was opened on June 29, 1913, and the first meals were served to veterans at supper that evening. As the veterans arrived they were greeted by Boy Scouts, the Boy Scout organization had begun in England just Six years before the reunion, who escorted them to their respective camps, which were organized into state encampments. The Scouts, who were quartered in the Seminary on Seminary Ridge, were constantly available in the camps to run errands for the elderly veterans. The four days of events were organized into Veterans' Day, Military Day, Civic Day, and National Day, but the overriding activity of the veterans was intermingling and meeting with one another and talking over the events of 50 years before.